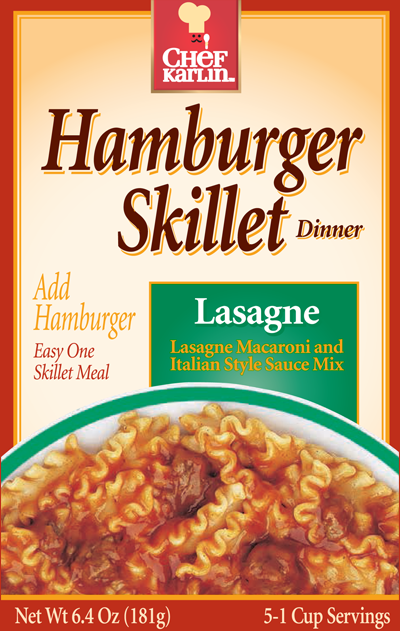 Ingredients: Enriched Pasta (Wheat Flour, Niacin, Iron, Thiamine Mononitrate, Riboflavin, Folic Acid), Sugar, Enriched Flour (Wheat Flour, Niacin, Iron, Thiamine Mononitrate, Riboflavin, Folic Acid), Corn Starch, Salt, Tomato*, Monosodium Glutamate, Partially Hydrogenated Soybean Oil, Citric Acid, Modified Corn Starch, Onion*, Spices, Cheddar Cheese (Pasteurized Milk, Cheese Culture, Enzymes, Salt), Garlic*, Hydrolyzed Corn Protein, Autolyzed Yeast Extract, Paprika (color), Ascorbic Acid, Yellow 5 Lake, Yellow 6 Lake, Red 40 Lake. Stir in 2 cups milk, 1¼ cups hot water, sauce mix and uncooked macaroni. Reduce heat; cover and simmer about 14 minutes, stirring occasionally, until macaroni is tender. In a 2½ -quart microwaveable bowl or casserole, crumble 1-pound of ground beef. Mix in uncooked macaroni, sauce mix, 2 cups milk and 1½ cups boiling water. Microwave uncovered on HIGH for 10 to 15 minutes, stirring every 5 minutes until macaroni is tender. (Sauce will thicken as it stands).